The beauty of Malibu will be explored in On Location in Malibu 2018: Paintings by the California Art Club at Pepperdine University's Frederick R. Weisman Museum of Art from Saturday, May 19, through Sunday, July 29. A special reception to meet the artists will be held on Saturday, May 19, from 4 to 6 PM. This exhibition is the seventh in a triennial series that began in 1999. It consists of more than 70 paintings of Malibu created by artist-members of the California Art Club—the oldest continually operating artist association in the state. The current members include many of the best realist artists in the state. Members were invited to visit Malibu during this past year and create art specifically for this exhibition. Encouraged to use their creative imagination, some chose to paint overlooked places of exquisite beauty. Others looked at familiar landmarks such as Malibu Pier or Point Dume, but captured them in unique ways. The Weisman Museum has had a long-standing interest in art that depicts Malibu. In 1998 the museum organized Historic Paintings of Malibu, which focused on early works produced from 1890 to 1940. 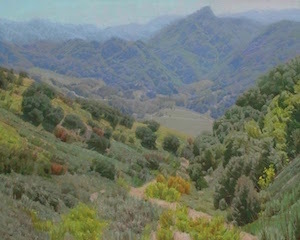 It included a rare group of California Impressionist canvases from 1897 that were commissioned by Frederick Rindge to celebrate his recent purchase of the old Rancho Malibu. This exhibition was a great success and many in the community asked for a sequel. Because the historic paintings are rare, the museum turned to the California Art Club, which is dedicated to continuing the legacy of the original California Impressionist painters. The first exhibition with the California Art Club was held in 1999, the second in 2003. Since then it has become a triennial event, always attracting new artists and new visitors. The originality of the artists’ vision is seen in such works as Frank M. Serrano’s Moonlight and Shadows,which depicts one of Malibu’s iconic lifeguard towers. By showing the scene late at night, illuminated by moonlight, it gains a new sense of poetic mystery. Michael Obermeyer’s The Golden Coast depicts Point Dume, one of the city’s most recognizable landmarks. He chose to view it from above and seen through foliage, as if you were a hiker who has descended from the hills and suddenly came upon this picturesque rock formation. 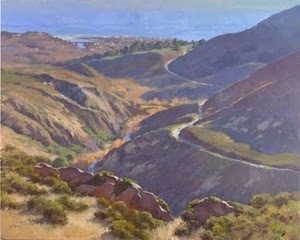 Through the eyes of these painters, we are invited to look upon the California landscape in novel ways. A good number of these paintings were created in “plein-air.” This French term, meaning “open air,” refers to landscape paintings executed outdoors. By working on location and directly in front of the subject, artists can respond to nuances of light and atmosphere that have to be seen in person. These paintings display a depth of perception and a poetry of subjective interpretation that give them their deep appeal.Although the technique of plein-air painting is over 100 years old, this art reveals that the style is flexible and resilient. Each artist has his or her own stylistic approach, creating works that are stunning reminders of the rare beauty of Malibu. Art in the exhibition is available for purchase. A portion of the proceeds will benefit the California Art Club and the Frederick R. Weisman Museum of Art. Founded in 1909 by the first generation of California Impressionist painters, the California Art Clubis an educational nonprofit organization devoted to supporting contemporary realist art. As one of the oldest, largest, and most active artist organizations in the country, the California Art Club is committed to keeping traditional art alive through exhibitions and unique outreach programs. Admission is free and the event is open to the public. For additional information about the exhibition, visit the Weisman Museum website.